Vietnam’s rapid progress in research and application of biotechnology in agriculture is contributing to the country’s goals for green growth and farmers’ demands, according to experts. 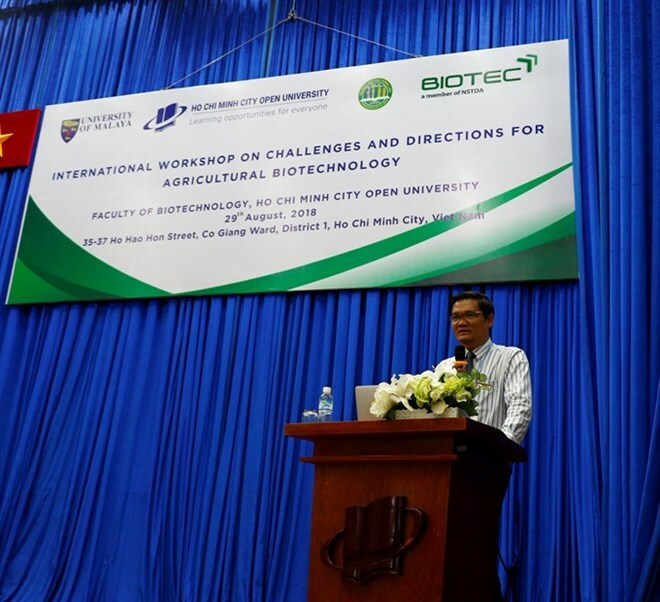 Nguyen Ngoc Bao Chau of the HCM City Open University’s Faculty of Biotechnology said that in the last five years “many institutes, universities, centres and startups in the country including HCM City have conducted research and developed effective applications for biotechnology in agriculture”. Chau was speaking on the sidelines of an international workshop on agricultural biotechnology held on August 29 by HCM City Open University. Researchers in the country have used biotechnologies to improve the quality of seeds as well as plant and animal breeds, he said. Biotech methods have been able to detect plant diseases rapidly, and have also been used to create products that prevent disease and pest infestation. Nguyen Bao Quoc of the Agriculture and Forestry University said that many global scientists have developed numerous techniques for the detection of microbial pathogens, but these methods are labour- and time-intensive and can be undertaken only in well-equipped labs. His group has developed an alternative approach for rapid detection of many groups of phytoplasmas (bacteria transmitted to plants by insects) that cause witches’ broom and white leaf disease in longan, cassava and sugarcane plants. Duong Hoa Xo, Director of the Biotechnology Centre of HCM City, said the centre had collected and preserved gene sources, with 360 varieties of orchids, including precious ones that grow in the country’s forests, 124 varieties of bonsai, and 100 varieties of herbs. A bank for microorganism genes had also been set up, which uses scientific techniques to insert genes with useful characteristics, such as disease-resistance characteristics of one flower to another. The centre had also conducted research on vaccines that protect against diseases among tra catfish, he said. Bui Minh Tri of the Agriculture and Forestry University said that his group had completed research on the mini Dendrobium plant, which has a number of advantages, such as early and frequent flowering, diverse colors and shapes, and varieties with nice fragrances. The plants are suitable for decorating in limited spaces. At the workshop, researchers, scientists, and students from universities in Malaysia, Thailand and Vietnam gave presentations about their research. Rujira Tisarum of the National Centre for Genetic Engineering and Biotechnology in Thailand presented a study on the potential of halophytes and glycophytes for salt removal in highly saline wastewater and soils.